Diamond plated on cutting edge surface of wire. 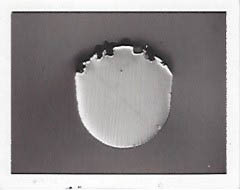 Cutting surfaces of wire (left and right) and sample cross-section of unused wire. Combining years of crystal growth experience with thermochemical modeling expertise is resulting in new understanding on the effect of high temperature reactions in sapphire crystal growth, which will lead to improved growth of sapphire in vacuum for higher purity. Crystal growth modeling of silicon will help establish the process for growing square single crystal slicon to achieve higher efficiency and reduced cost for solar energy. Our goal is to grow square single crystal combining higher material utilization and higher efficiency to lower cost of solar energy. In addition, sapphire growth technology will be upgraded to increase quality at lower cost. Combining years of crystal growth experience with high temperature thermochemical reactions is resulting in new understanding of the effect of high temperature reactions during sapphire crystal growth, which will lead to growing sapphire in vacuum for higher control and purity. During growth of sapphire in graphite furnaces, small variations in inert gas pressure at different stages of the run were found to be critical to reproducible crystal quality. As the growth was scaled up, unexpected changes in the growth were found, that were thought to be due to thermal or mechanical effects. However, some thought these changes may be due to changing reaction kinetics in the furnace. Crystal Systems Innovations is conducting research into the fundamental chemistry of deleterious reactions in the furnace in the Al-O-Mo-C system to better understand the impact of crystal growth size on these reactions and on crystal quality. Research was based on determining local equilibrium in each part of the furnace, and evaluating the kinetic and equilibrium factors effecting the rates and extent of these reactions. It has been found that scale up of the crystal growth results in critical changes in the extent of these. Identification of the key parameters can lead to improved crystal quality as the size is increased.